Rush Limbaugh Flees "Liberal Hoax" Hurricane Irma - Joe.My.God. Rush Limbaugh closed out his popular radio program on Thursday by announcing he would be off the air on Friday and broadcasting next week from ‘parts unknown’ as he and other residents of Palm Beach were ordered to evacuate before Hurricane Irma made landfall in Florida. 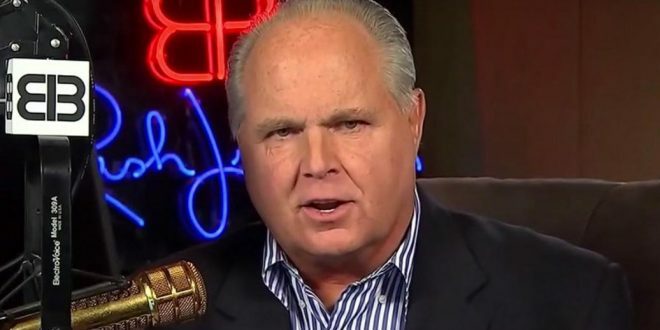 That announcement came just two days after Limbaugh delivered a dismissive diatribe in which he downplayed the threat of the then-Category 5 storm, stating that reporting on the natural disaster had become ‘politicized’ and was being used to advance the notion the climate change is real. There was no offer of an apology or any remorse however for the comments he made on Tuesday. ‘There is a desire to advance this climate change agenda, and hurricanes are one of the fastest and best ways to do it,’ said Limbaugh at that time. His downplaying of the storm’s threat immediately drew the ire of ‘Today’ meteorologist Al Roker. ‘To have Rush Limbaugh suggest warnings about Irma are fake news or about profit and to ignore them borders on criminal,’ wrote Roker on Twitter.